I've been noticing lately, I've learned so much about nails through this whole process of blogging that it's rare I find something new or surprising. I love being able to learn new things about nails or new techniques to try so I was really excited about today's discovery. I'm not new to the concept of skittles or painting my nails all different colors, but I've been hearing about skittlettes quite a bit and I'll admit I didn't know what the difference was. A few googles later I found this great article about skittlettes that ChitChat Nails did for SoNailicious. It turns out that to have a true skittle manicure every single nail has to be different. 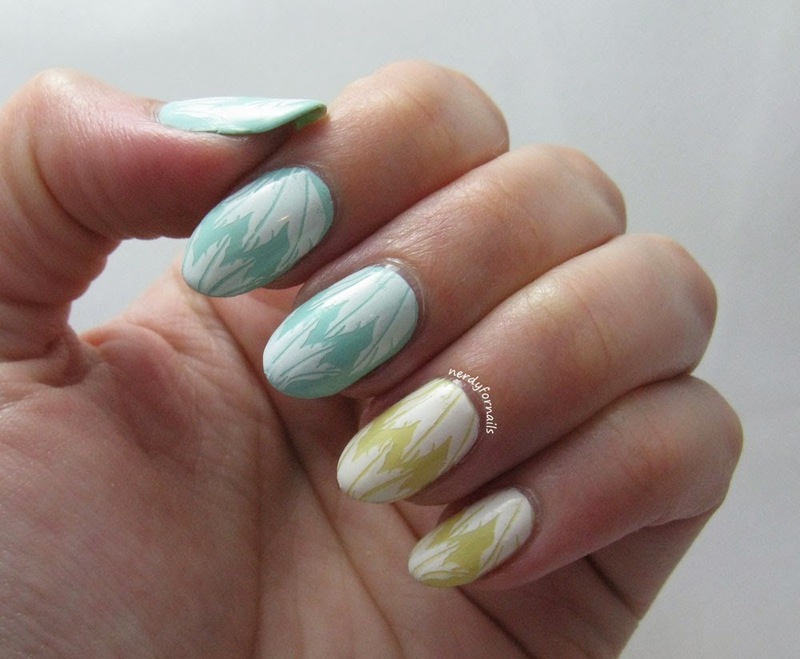 If a manicure with an accent nail has one nail that stands out then you can think of a skittlette as a manicure with two accent nails. 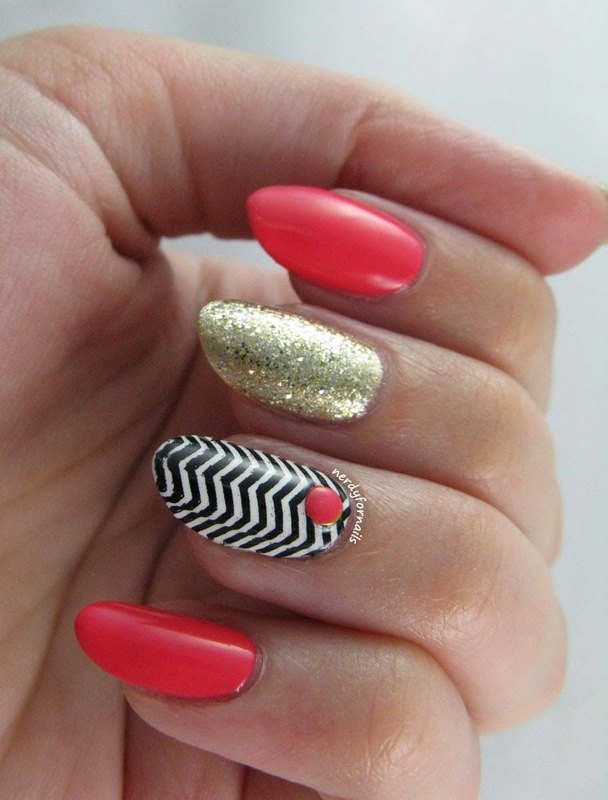 I've been doing nails like this forever and just didn't know what to call it. I love ChitChat Nail's description of how this technique came to be and her tips for creating a successful skittlette, so if you have a free minute her post is definitely worth checking out. 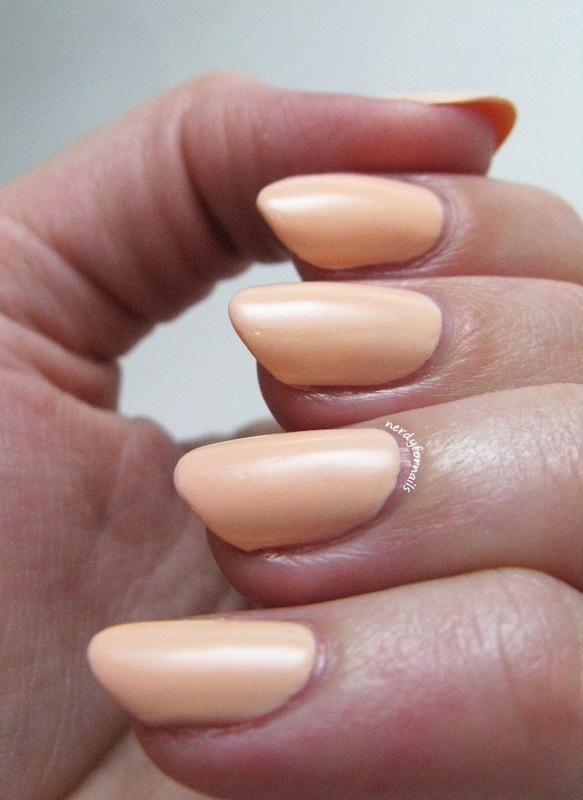 The coral nails are two coats of NYC Tropicoral from the City Samba collection. I was sent this polish to review and I'm quite happy with it. It went on smoothly and had a nice opacity in two coats. The first thing I thought when I saw this collection is that the colors reminded me a lot of the OPI Brazil collection that came out this summer which I didn't want to dig into my pocket deeply enough to afford. I love that NYC came out with a similar line of bold summer shades that are a lot easier on the wallet. These run about $1.99 when they're not on sale which of course I love since I'm cheap at heart. Another cheapie trick- I used Tropicoral to paint a plain gold stud to perfectly match my manicure. Why buy a whole separate set of colored studs when you can create any color you want with polish you already have? The gold nails are two coats of LA Colors, Deluxe topped with two coats of Sally Hansen Complete Salon Manicure in Golden Rule. 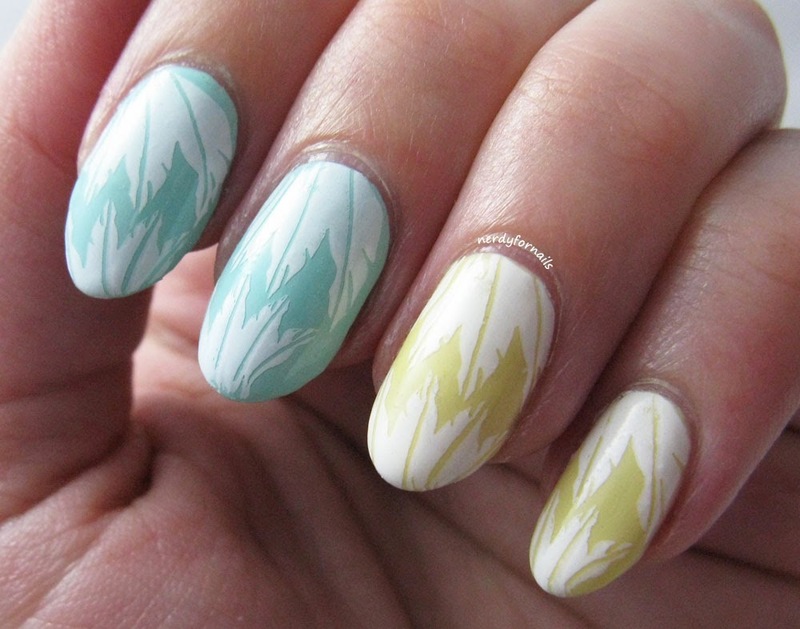 For my fancy chevron accent nail I started with two coats of LA Colors white. When that was dry I stamped over it with Bundle Monster plate BM-201 and Mundo de Unas black. I stuck on my special painted stud with a bit of clear polish and then topcoated the whole thing to make it shine. I absolutely love this combination of colors. 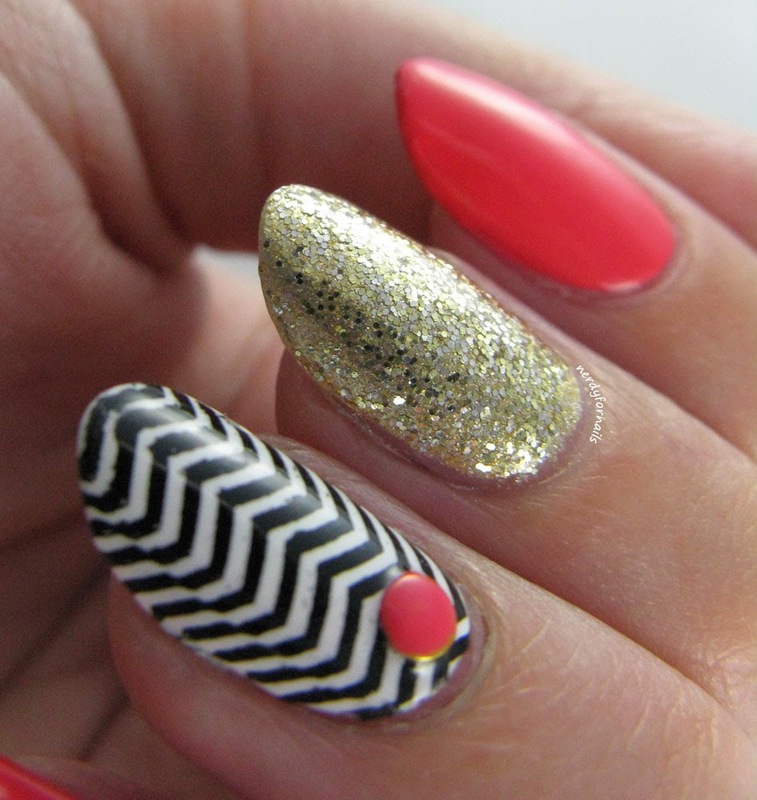 What's your best kept nail secret? Anything that's surprised you after years of doing your nails? I'm still on my summer pastel kick. Regrettably everyone said these looked like Easter egg nails which was definitely not my intention, but I can see where it might have gone wrong. I think these colors go nicely together despite the unfortunate comparison to dyed eggs. I've got on two coats of both polishes- Spoiled, Mar-zi-panna (blue) and Sinful Colors, Unicorn (yellow). 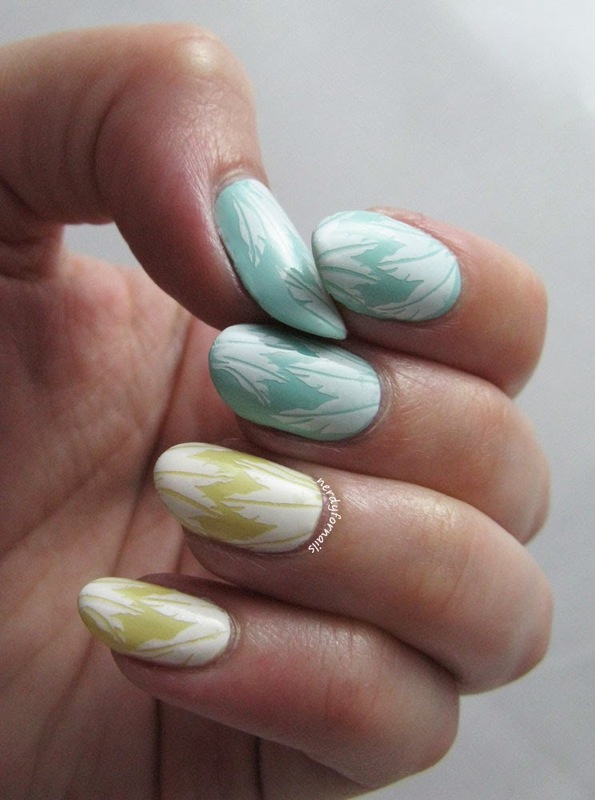 I stamped each nail with Bundle Monster plate BM-214 and Mundo du Unas white polish. Today I'm posting another one from the archives. I painted these quite a few weeks ago and never got around to posting them, but I will today because I love this color. 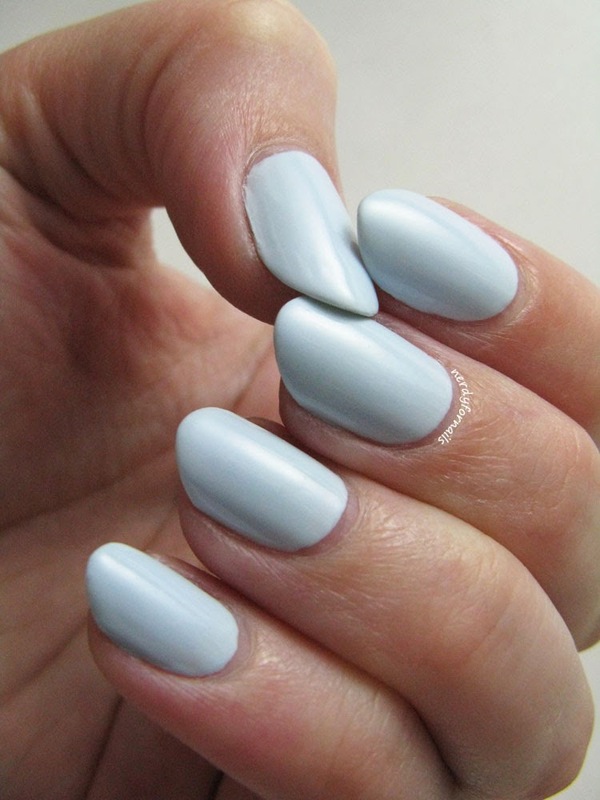 I've been searching for a blue so pale it almost looks white. This isn't quite that shade, but close enough to make me happy. 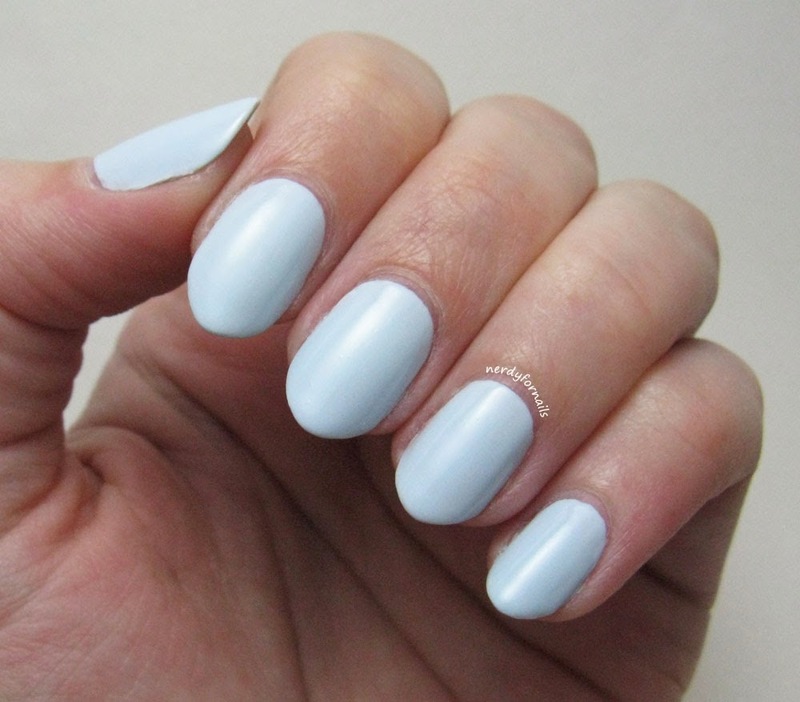 This is Love & Beauty Light Blue from Forever 21. They gave up trying to name their polishes even somewhat creatively, but I give them a pass because the price is great. The formula is pretty good and the wear time was also decent. I'm wearing two coats here. I picked this one up on clearance for 99 cents so even more bonus. I can't resist checking out polishes everywhere I go and no trip to Forever 21 is complete unless at least one polish makes it into my bag. I've been dying over the Maybelline Color Show Bleached Neons collection, but not enough to actually go out and look for/buy them. The problem is while I think they look great together I don't necessarily love any of the colors individually. 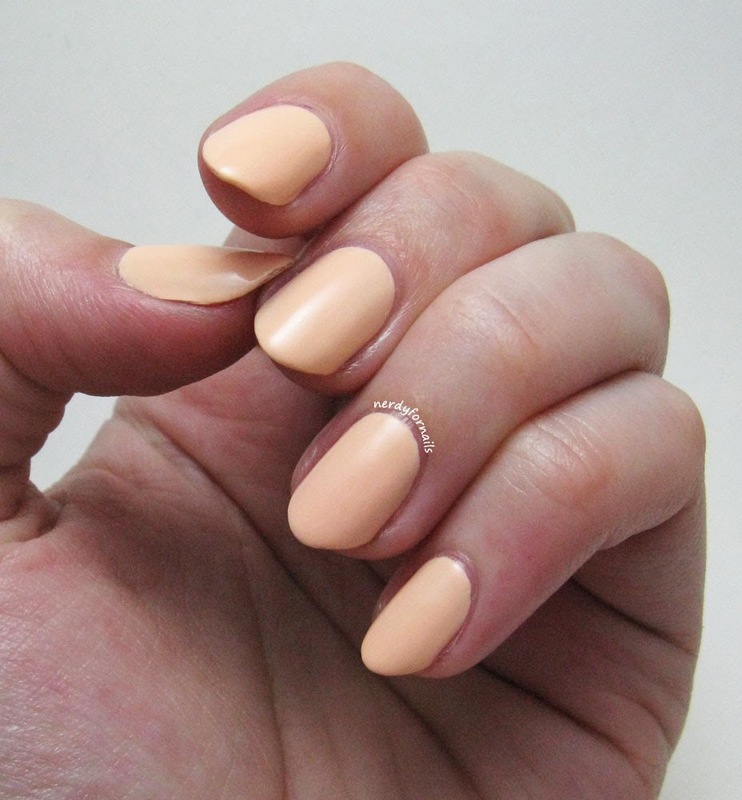 Out of all of them the peach shade was my favorite so I set out to franken my own version of Bleached in Peach. It's not a dupe for sure, but I really love how mine turned out. I named it Bleached Peach- soooo creative of me. You might also notice I'm about two months behind on posting my manicures and I've been going a bit out of order. I painted these right after I filed my nails into their new shape. If you scroll back through the last three I posted you can see how the shape has been progressing and becoming more refined (and longer). I noted on my first post after changing the shape I started out a little too short to successfully pull off almonds and this post shows it. They were a bit nubby for what I was hoping to accomplish, but happily it all works out right in the end. Now for the "recipe." I'm glad I wrote it down because there's no way I'd remember now. I started out with a mini bottle half full of white polish. I added in some random unnamed orange cream polish and Sinful Colors, Boogie Nights (a sheer coral shade). It wasn't looking quite the shade I wanted so I added a few more things to tweak the color a bit. I put in a few drops of Diamond Head Breeze from Island Girl (this one is a bright neon pink) and a few drops of Sinful Colors, Unicorn (a pastel yellow). I shook it all up and this is how it came out. The formula was truly awful. It could have used a few (or ten) drops of thinner but for some reason I stubbornly struggled through most of the manicure without adding any. I think the white polish I started out with was from an old bottle and was a bit too thick from the beginning. Otherwise I was really happy with my creation. 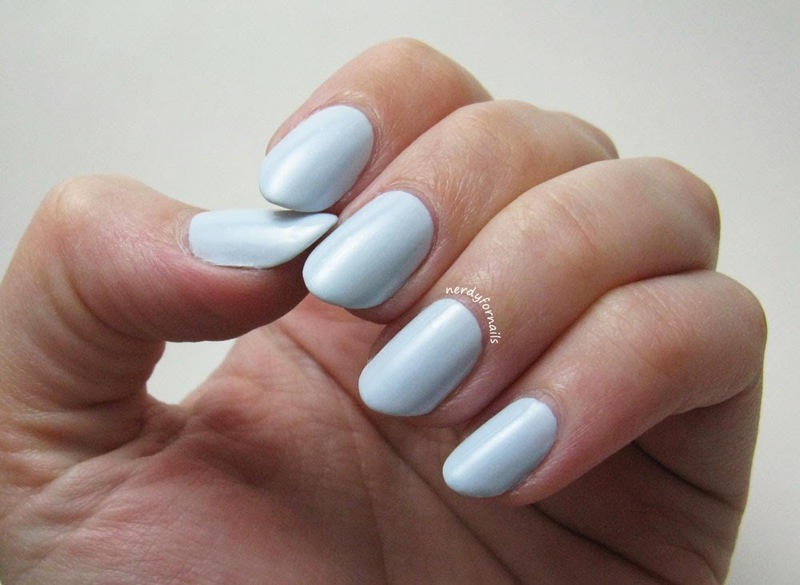 This color is perfect for summer and the wear was decent. I love being able to throw together polishes I already have to make something new to suit whatever mood I'm in.